Loaded inside a Sun-Blessed Sumatra wrapper, the rich blend of Nicaraguan tobaccos are deliciously infused, with a taste similar to that of a sweet espresso. Featuring a rich, creamy taste rooted in its core, Isla del Sol cigars deliver a smooth smoke with an inviting aroma, a sure crowd-pleaser. 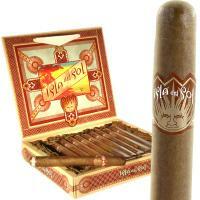 Drew Estate did this one right, by creating this cigar much like it did its very popular Acid cigar line. If you are a fan of mild cigars, Isla del Sol by Drew Estate may be your new favorite cigar.